Sindié: Sa Pagsisismula ng Indie will be shown at Robinsons Galleria’s IndieSine until July 14. 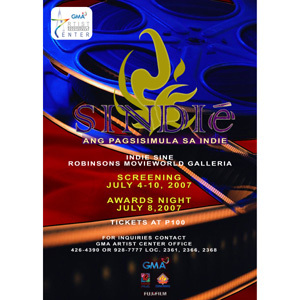 GMA-7, in cooperation with the Independent Filmmakers Cooperative (IFC), has mounted its first festival of short films, Sindié: Sa Pagsisismula ng Indie, at Robinsons Galleria’s IndieSine. All 14 featured short films in this festival are created by students of the Acting and Film & TV Production Workshops conducted by the Kapuso Network. It is a full-production workshop where participants are taught to write, direct, light, edit and produce their first short films, engaging the actors enrolled in GMA-7’s sister summer workshop in acting. The 14 shorts, products of the workshops in June and October 2006, and April 2007, are: Katha, Saka, Mga Kuwento Kong Sana, Taong Grasa, Otra Ves, Sidewalk, Kasal, Baritada, and In A Flash (8 minutes), Lea, Batang Bato, Binhi, and Photo Express, and Glen Con Banyo. The festival started last July 4 and will end on July 14 (Saturday). Screenings are scheduled from 12 noon to 10 p.m. Viewers are encouraged to vote for the People’s Choice Award in preparation for the awards night, which is scheduled on July 8 (Sunday). Tickets are priced at P100, good for all 14 films.